Lynne had an extraordinary experience in education, largely due to serious health problems that began when she was very young. At around age 8, she developed a health condition than brought with it debilitating pain and subsequently led to many and extended absences from school. By age 10, she was confined to a wheelchair, and unable to attend her school due to accessibility problems. She was eventually moved to another school but remained wheelchair-bound until age 12 and suffered significant disruption to her education: “This was all taking time and I missed so much of my primary education towards the end. My last memory of being at school full-time was in P4.” Further health problems developed just as she was entering secondary school. After just a few months in S1, she was no longer able to travel; she was home-schooled for a while but her illness made it difficult to concentrate, and so it continued until she was past the age of compulsory education. Indeed, her health remained a significant issue right up until her early 20s, when she began to see signs of improvement. “When I got to the age of about 22, I started to feel that I could maybe start physically pushing myself a wee bit. I built it up gradually and I fought it really hard.” When she felt strong enough, she told her parents that she wanted to start working, even though it would mean the loss of her disability benefit, as well as her mother’s full-time carer’s allowance. She found an understanding employer who allowed her to work a few hours per week in a retail shop, and it was there – working alongside other people her own age who were all studying at university – that she began to consider a return to education. 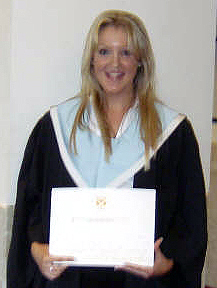 Her research led her to North Glasgow College and the Access to Science programme where she received a warm welcome and encouragement, despite the fact that she had been out of education for so long. “That’s what I thought was really great, because they didn’t discourage me, even though they knew I had to start totally from scratch.” As it happened, Lynne discovered a love of learning and the ability to absorb new information very quickly. She passed all of her assessments and applied to GCU to study Optometry, which was (at that time) a route that required additional study in Maths and Physics. With support from North Glasgow College and GCU, she completed all of the requirements and her application was successful. She has since graduated with a 1st-Class Honours degree in Optometry and, in 2013, earned her PhD. In 2015, she was made a permanent Lecturer in Vision Science at Glasgow Caledonian University.